Gavop compared numbers from the cityofchicago.org public database on the total number of construction-related permits that each company obtained. 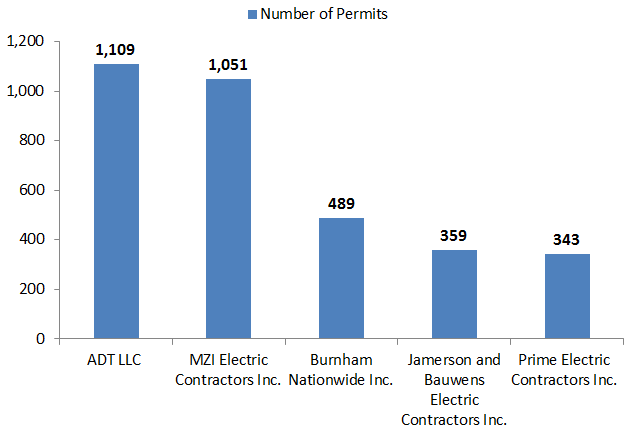 Looking at each company’s total number of permits helps gauge how many projects individual companies are working on. As of 2017, ADT LLC has received the largest number of permits at 1,109, followed by MZI Electric Contractors Inc. at 1,051. Statistics suggest that these two organizations carry out most of the permits in the city because the next highest number of permits have been granted Burnham Nationwide Inc. at just 489. Following Burnham Nationwide is Jamerson and Bauwens Electric Contractors Inc. with the fourth largest number of permits (359) and Prime Electric Contracts Inc. with 343 permits. The following graph shows the top five contractors in Chicago by number of permits in 2017. Additionally, of the top 25 contractors by permits received in the city, the total number of permits ranged from 135 to 1,109. It is important to note, however, that the contracting firm with the highest number of permits is not necessarily the firm carrying out projects of the highest value in Chicago. 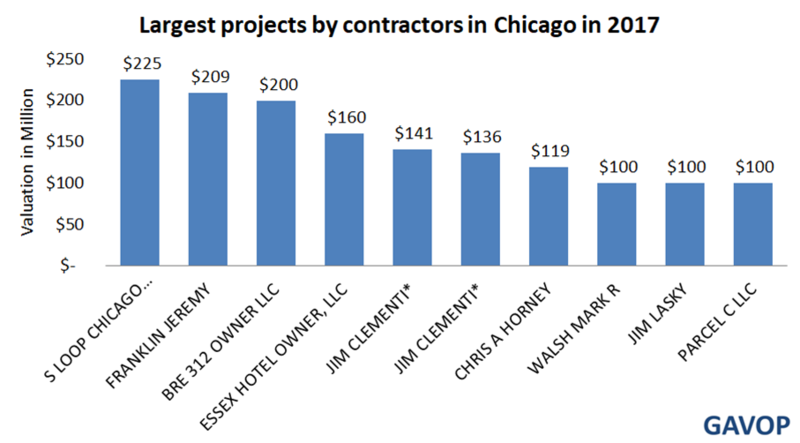 Analysis of the data by valuation (or worth in dollars) of a project shows that S Loop Chicago Development II LLC is responsible for the most expensive construction project in 2017. S Loop landed the contract to construct a 76-story residential tower with 800 dwelling units, ground floor retail, and 11 levels of parking, a project valued at $225 million. In fact, of the top 25 contractors by permits, none is responsible for the top 10 construction projects by valuation. The following graph illustrates the contractors who received permits for the largest projects in the city by worth in dollars. Overall, the data suggest that Chicago’s construction market can be viewed from two aspects: the total number of projects a contractor works on vs. contractors who oversee the largest projects in terms value. In this case, organizations with the largest number of permits do not correspond with the organizations that carry out the highest valued construction projects.